Head and neck cancer treated with surgery and/or chemotherapy can leave patients with long term swallowing problems. This type of cancer in the past typically occurred in a patient with high smoking and alcohol history in the age group of 60 plus. This demographic has changed due to the reduction of smoking. There has been an increase in younger patients (40-50yrs) who have looked after their health (never smoked and have moderate alcohol consumption) and the diagnoses of head and neck cancer comes as a shock. This change in demographic is due to human papilloma virus (HPV) being one of the main causes of the increase in head and neck cancer (1). HPV is mostly associated with oropharyngeal cancers of the head and neck and is treated with radiotherapy either before or after surgery. It is the swelling and inflammation resulting from this which impairs the ability to swallow. Nasopharyngeal cancers (NPC) occur in populations who have immigrated to western countries from southern China, South Asia, the Arctic, and Middle East (2). Risk factors include Epstein-Barr virus and diet. Foods preserved with salt are often dietary staples and during the process nitrosamines are produced that are known to be carcinogenic. There is evidence that a diet high in fruits and vegetables (high anti-oxidant) is protective and can decrease the risk of NPC (3). To prevent weight loss after cancer treatment, high protein high energy and altered texture diets are recommended. Textures such as hard crusts and grains are to be avoided because they are harder to chew and swallow. Raw vegetables and hard parts of fruit are also to be avoided. We know that the skins of fruit and vegetable are where some of the anti-oxidants reside, so attention needs to be paid to keeping the fruit whole and vegetable high while also increasing protein intake. Speech Pathologists will be available after treatments to advise on the textures and consistency of fluids to help manage ongoing food intake. Modified texture meals are standardised in food services to help the patient through their admission. A visit from the dietitian is also advised. Processing foods to modify the texture will inevitably alter the anti-oxidant content. This includes vitamins (both water soluble and fat soluble), minerals through loss in cooking water and the phytonutrients. To state the obvious, steaming the fruit and veg and as short a possible storage time after chopping/puree is recommended. This is not always practical and information about the detail of loss of nutrients from foods varies for each one. If you imagine a 50% loss with each process (chopping, cooking, freezing, reheating) the changes are significant. What we do know is that the health conscious patient is aware of the “Super Foods” that are advertised as packed with certain nutrients and will want to include them in their new modified texture diet. Berries, green and orange vegetables, plus soy products, tea and chocolate are all part of this anti-oxidant rich mix. Research tells us that the nutrients in foods have a ‘synergistic’ effect which means that the whole food is needed, not just the vitamins etc., which you could get as a pill or powder. Although dairy foods are avoided by some people, a conversation with the patient around the benefits of milk are important. Dairy products provide fat- soluble anti-oxidants that may be lacking in plant foods, and these again work synergistically to prevent oxidative damage to the body. The anti-carcinogenic and anti-inflammatory effects associated with milks most potent fat -soluble anti-oxidant (conjugated linoleic acid (CLA) work with vitamin A, vitamin E and coenzyme Q in milk. Milk also provides a complete set of amino acids for body repair (4). Soy milk can be substituted but does not have all the benefits. The Soy product Tofu is an excellent soft texture. Australian Dietary Guidelines provide the basic portion control food to include in a healthy diet (5). Food processing as chopping/puree in a food processor will mean that an additional amount will be needed to make up for the loss of food in the equipment. So, the amount of the food being processed needs to be increased when planning the shopping. 1. Young D et al. (2015). Increase in head and neck cancer in younger patients due to human papilloma virus (HPV). Oral Oncology vol. 51,8: 727-730. 2. Liu Y et al. (2011). Detection of Epstein-Barr virus DNA in serum or plasma for nasopharyngeal cancer: a meta- analysis. Genetic Testing and Molecular Biomarkers 15:495-502. 3. Chuang SC et al. (2010). Diet and the risk of head and neck cancer: a pooled analysis in the INHANCE consortium. Cancer causes and Controls 23:69-88. 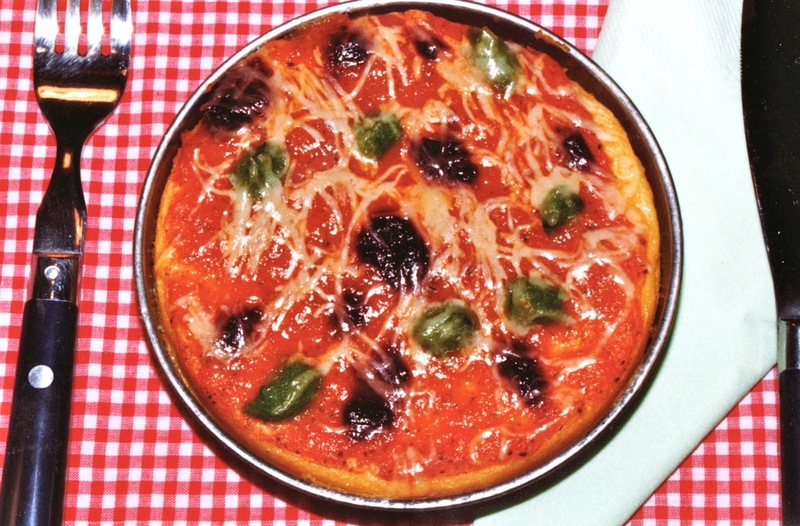 Preparation of a soft diet pizza base can be challenging. In my publication Super Foods for Small Appetites I created a soft polenta base with purée or soft texture toppings. See illustration. This works extremely well but can be very filling to eat; and leftovers are not always desirable when the appetite is poor. The very recent trend to chop cauliflower finely, to steam and substitute it for rice (to cut kilojoules from the diet) has led to a recipe in ‘Australian Healthy Food Guide’ (Sept. 2015, page 22) for a Cauliflower Pizza Crust. I tried this with my family, with an overwhelmingly positive result. It occurred to me that it was perfect to adapt it for a soft diet and even a minced and moist diet if the toppings were suitable. I chose toppings to meet the requirements of a soft diet. The very small orange tomatoes on the topping were roasted with a small sprinkle of salt, and a spray of olive oil until the skin became very soft. This may not be acceptable in some cases and you could easily substitute with skinned roasted capsicum or skinned tomato. 1 tsp dried oregano or 2 tsp fresh finely chopped. 1 avocado peeled and stone removed (approx. 200g). 1. Cut cauliflower into small pieces and finely chop in a food processor. 2. Transfer to a microwave proof bowl, cover and cook for 8 mins. Leave to cool and drain well squeezing some of the water from the soft mass. 3. Preheat oven to 200C or 180C if fan forced and line two pizza trays with baking paper in preparation for the prepared crust. 4. Mix the cauliflower with the eggs, oregano and one third of the Parmesan cheese until a thick cohesive mass is formed. 5. Press into trays to make 2 round shapes, approx. 22cm round and 3-4mm thick. Spray with olive oil and bake for 15 mins. 7. Bake for a short time until cheese has melted. Nutrition Information per serve: Energy 1384kJ, protein 19g, fat 23.9g, sat fat 7.9g, carbohydrate 7.2g, fibre 6.3g, sodium 436mg. Cooked pumpkin, feta cheese and baby spinach. Ham, skinned capsicum and onion cooked until soft plus cheese (parmesan works best, without going tough in the oven). Sardines, goats cheese and soft cooked figs or quince. Toppings for a minced and moist diet could be cooked and chopped until pieces less than 0.5cm, but would need to be served with a thick sauce. It may be safer to purée any toppings to go onto the cauliflower crust that in itself has a soft cohesive texture easy to break up in the mouth with the tongue. It seems there are many factors to take into account in our humble porridge breakfast. I understand the importance of the whole grain perspective with low glycaemic index (GI) keeping our insulin levels at bay. The new steel cut oats (I chose to buy the Uncle Toby product) has the lowest GI so I decided to give it a try. I thought that being cut up would provide a smaller particle at less than 0.5 cm to maybe make it suitable for a minced and moist diet. Well I missed the toasted label and no matter how long I cooked it the particles remained “nutty” true to the advert. The bits would be a nightmare for anyone with dentures and remained around the mouth to maybe cause problems for swallowing accidents later in the day. The other consideration of particle size prompted me to try “steel” cutting in my food processor to create smaller pieces of my traditional oats (the next lowest GI option). I had no idea whether this would raise the GI but I guessed it would make it easier to digest. The results were superb! Easy to eat with no lumps lowered cooking time for 2 serves (3 mins in the microwave instead of 4-5), and a cheap product from the local brand of supermarket. (99c for 750g as opposed to over 5 dollars for the steel cut oats). Now I was on a mission! How could I improve the protein and fibre of my breakfast to meet the nutrition requirements for the elderly of at least 20g of protein and 10g of fibre. This would be a helpful recipe for aged care homes as well as for modified texture diets at home. I trialled making the porridge with all milk, adding extra skim milk powder and oat bran before cooking and a teaspoon of honey with a heaped tablespoon of Greek Yogurt to serve. The result was very popular, was suitable for Soft and Minced & Moist diets, and almost met the nutrition goal. The mixed meal using milk would lower the GI and addition of oat bran improve fibre and mineral content. The fibre content of the meal can be further increased by addition of fruit as desired. Process rolled oats in food processor until pieces < 0.5cm. Mix skim milk powder into the milk before adding it to the processed oats and oat bran. Cook in microwave on high for 2 mins, stir and cook again for 1 further minute. Serve with a teaspoon of honey and a heaped tablespoon of yoghurt. These may need to be mixed in at the table to minimise mixed texture. The yoghurt will also minimise the slightly cohesive nature of the porridge. Nutrition Information per serve: Energy1260kJ, protein18.6g, fat 4.2g, sat fat 0.8g, carbohydrate 45.7g, sugars 21.8g, fibre 4.0g, calcium 419mg, magnesium 100mg, iron 1.9g, zinc 2.2g. 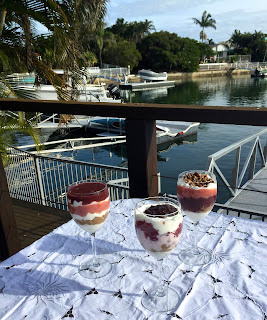 To celebrate Dysphagia Month I searched for some delicious dessert options. Time is precious when you are caring for someone who needs special food. As a dietitian I am aware of the need to balance the diet as well as making the food tasty and looking good. When I am testing and presenting new recipes to my own family for comments I become overwhelmed with the efforts of cooking and washing up, thanking my lucky stars for my dishwasher. In a recent article in DYSPHAGIA CAFÉ called ‘Moving beyond the isolated swallow: Dysphagia in the context of a shared mealtime’, Samantha Shune reflects on the shared mealtime and ageing. The assessments and interventions from the therapist must reflect the multifactorial nature of the process. The therapist needs to know and be part of the education of other members of the group or family. If the family meal table or social group is available for normal socialisation for at least some meals of the day the food is a large part of the pleasure of this. If at least some of the components are presented to share and thought of as delicious then life is good. The time taken to prepare different meals for the various members around the table can become a burden for the carer/cook. This can be solved by preparation of some of the courses like smooth thick soups (see previous blogs) and desserts (see ‘Super Foods for Small Appetites’) for everyone. The family can then pick and choose to suit their appetite at that time, and may be unaware the items are designed to be suitable as smooth purée. Often a small appetite can only manage the soup and dessert. If these are prepared using all the food groups this will often suffice. A traditional colourful dessert bought at the local ice cream parlour when I was a child used to be called “A Knickerbocker Glory”. The components are presented in layers and consist of jelly, custard, fruit, ice cream, and cream. A more contemporary name is ‘Parfait’. The acceptance within the family and or social group of the safety aspects and consequences of eating the ‘wrong’ food has to be part of the story along with the acceptance of any other sort of diet or preferences where there are restrictions. This should mean that the items and foods available at the table are there for some who choose it. 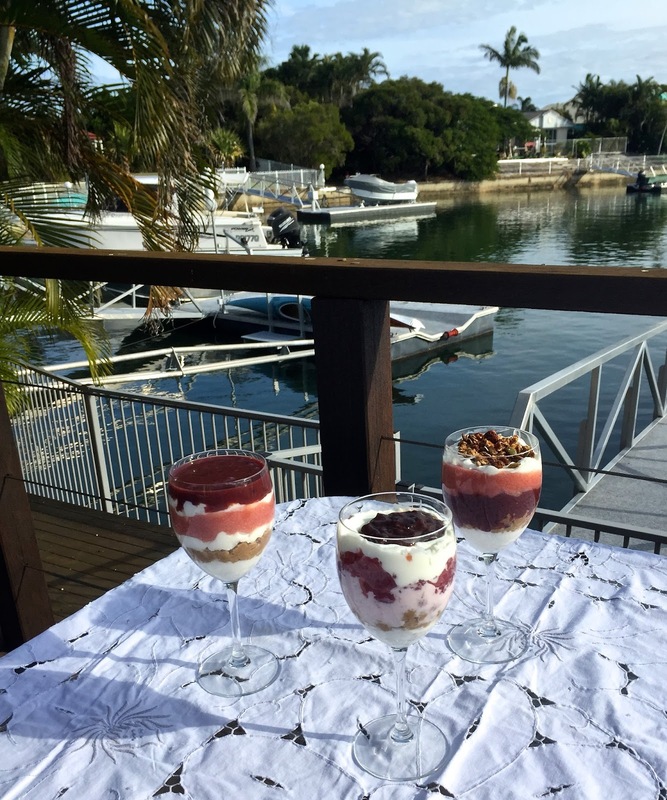 For example the granola, made from oats, nuts, seeds and maple syrup sprinkled on the parfait are not suitable for the person with dysphagia or indeed the very little people in the family. The recipes I offer here can be part of this sort of presentation and the family can mix and match according to their taste. My family like both vanilla and chocolate custard as part of their chosen layers. Thick custards are available in the supermarket, as are flavoured mousses if time is limited for preparation. 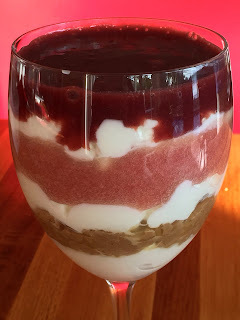 I chose to offer a recipe for a soft fruit jelly, made from fruit juice, gelatine and some tapioca flour to ensure the jelly does not melt too quickly in the mouth; an apple and rhubarb snow; an iced coffee mousse and I suggest plain yoghurt or custard to separate the layers. If a high energy protein supplement is recommended I have included the recipe for RESOURCE® Fruit Flavoured Jelly. 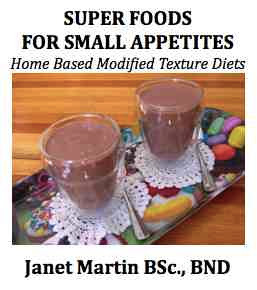 (adapted from “Super Foods for Small Appetites”). Add the water slowly making a paste initially. Heat either over hot water or more directly on a slow heat until the gelatine has dissolved and the tapioca mix has a glassy appearance. Slowly stir in the fruit Drink until well mixed. Serve broken up with a fork. Nutrition Information per serve (300ml): Energy 1334kJ, protein 12.9g, fat 0, carbohydrate 67g, sugars 40g, fibre 0.1g, sodium 91mg. (Other nutrients important as part of this supplement not shown). For the purpose of the exercise I made a Soft Cranberry Jelly and a Soft Queen Garnet Plum Jelly, substituting the Nestlé Healthcare Supplement with fruit juice. The family preferred the Queen Garnet Jelly as it had a full bodied sweet taste. Obviously a favourite fruit juice can be used, although I am told pineapple juice will not set. The amount of gelatine may have to be varied to achieve desired soft consistency. The amount made was enough for 4 glasses of the mixed layered dessert. Nutrition Information per 100g of QG Plum Jelly: Energy 262kJ. Protein 1.9g, fat 0, carbohydrate 13.2g, 10.7g, fibre 0.1g, sodium 8mg. Chop apples and rhubarb into small pieces and place in pan with water and sugar. Bring to the boil and simmer until soft, uncovered. Allow to simmer until product is thick. Blend in vitamiser until smooth. Whisk egg white until soft peaks form. Fold into the cooled fruit. Serve in a bowl or use as part of your layered dessert. Nutrition Information per 100g: Energy 143kJ, protein 0.9g, fat 0.1g, carbohydrate 6.8g, sugars 6.7g, fibre 1.4g. Combine coffee and hot water. Add milk. Pour mixture into pan and bring to simmer point. Combine gelatine and extra water, add a little of the hot milk from step 2 and stir to dissolve. Place coffee milk, dissolved gelatine, sugar and ice cream in vitamiser and blend until smooth. The idea of this is to create a product with a creamy froth topping. Pour into small glasses or coffee cups and refrigerate to set. Or use as a coffee layer in your layered dessert. Nutrition Information per 100g: Energy 386kJ, protein 5.0g, fat 4.0g, carbohydrate 9.6g, sugars 9.5g, fibre 0.1g, sodium 45mg.